Base class for all linear solvers. This merely defines standard interfaces for linear solvers, so that different solvers can be used in a clean and transparent manner. Note that LinearSolvers are primarily used to solve the linear systems arising in oomph-lib's Newton iteration. Their primary solve function therefore takes a pointer to the associated problem, construct its Jacobian matrix and residual vector, and return the solution of the linear system formed by the Jacobian and the residual vector. We also provide broken virtual interfaces to a linear-algebra-type solve function in which the matrix and the rhs can be specified, but this are not guaranteed to implemented for all linear solvers (e.g. for frontal solvers). Definition at line 73 of file linear_solver.h. Empty constructor, initialise the member data. Definition at line 100 of file linear_solver.h. Definition at line 104 of file linear_solver.h. Definition at line 116 of file linear_solver.h. Empty virtual function that can be overloaded in specific linear solvers to clean up any memory that may have been allocated (e.g. when preparing for a re-solve). Reimplemented in oomph::HelmholtzGMRESMG< MATRIX >, oomph::GMRES< MATRIX >, oomph::DampedJacobi< MATRIX >, oomph::ComplexGMRES< MATRIX >, oomph::GS< CRDoubleMatrix >, oomph::MGPreconditioner< DIM >, oomph::GS< MATRIX >, oomph::HypreSolver, oomph::SuperLUSolver, oomph::BiCGStab< MATRIX >, oomph::TrilinosAztecOOSolver, oomph::CG< MATRIX >, oomph::DenseLU, oomph::ComplexDampedJacobi< MATRIX >, oomph::MumpsSolver, oomph::HSL_MA42, and oomph::MGSolver< DIM >. Definition at line 183 of file linear_solver.h. Definition at line 220 of file linear_solver.h. Disable documentation of solve times. Referenced by oomph::NewMumpsPreconditioner::disable_doc_time(), oomph::HelmholtzMGPreconditioner< DIM >::disable_smoother_and_superlu_doc_time(), oomph::ProblemBasedShiftInvertOperator::ProblemBasedShiftInvertOperator(), oomph::ProjectionProblem< PROJECTABLE_ELEMENT >::project(), oomph::ARPACK::solve_eigenproblem(), and oomph::SuperLUPreconditioner::SuperLUPreconditioner(). Disable resolve (i.e. store matrix and/or LU decomposition, say) This function simply resets an internal flag. It's virtual so it can be overloaded to perform additional tasks such as cleaning up memory that is only required for the resolve. Reimplemented in oomph::HelmholtzGMRESMG< MATRIX >, oomph::GMRES< MATRIX >, oomph::ComplexGMRES< MATRIX >, oomph::GS< CRDoubleMatrix >, oomph::GS< MATRIX >, oomph::HypreSolver, oomph::SuperLUSolver, oomph::TrilinosAztecOOSolver, oomph::BiCGStab< MATRIX >, oomph::CG< MATRIX >, oomph::HSL_MA42, and oomph::MumpsSolver. Definition at line 138 of file linear_solver.h. Referenced by oomph::Problem::calculate_continuation_derivatives(), oomph::MumpsSolver::disable_resolve(), oomph::HSL_MA42::disable_resolve(), oomph::CG< MATRIX >::disable_resolve(), oomph::BiCGStab< MATRIX >::disable_resolve(), oomph::SuperLUSolver::disable_resolve(), oomph::GS< MATRIX >::disable_resolve(), oomph::GS< CRDoubleMatrix >::disable_resolve(), oomph::ComplexGMRES< MATRIX >::disable_resolve(), oomph::GMRES< MATRIX >::disable_resolve(), oomph::HelmholtzGMRESMG< MATRIX >::disable_resolve(), oomph::FoldHandler::FoldHandler(), oomph::HopfHandler::HopfHandler(), oomph::Problem::newton_solve_continuation(), oomph::AugmentedBlockFoldLinearSolver::resolve(), oomph::BlockPitchForkLinearSolver::resolve(), oomph::AugmentedBlockPitchForkLinearSolver::resolve(), oomph::AugmentedBlockFoldLinearSolver::solve(), oomph::BlockPitchForkLinearSolver::solve(), oomph::AugmentedBlockPitchForkLinearSolver::solve(), oomph::BlockHopfLinearSolver::solve(), oomph::ARPACK::solve_eigenproblem(), and oomph::BlockHopfLinearSolver::solve_for_two_rhs(). Definition at line 209 of file linear_solver.h. Enable documentation of solve times. Definition at line 119 of file linear_solver.h. Referenced by oomph::NewMumpsPreconditioner::enable_doc_time(), and oomph::ProjectionProblem< PROJECTABLE_ELEMENT >::project(). Enable resolve (i.e. store matrix and/or LU decomposition, say) Virtual so it can be overloaded to perform additional tasks. Definition at line 132 of file linear_solver.h. Referenced by oomph::ProblemBasedShiftInvertOperator::apply(), oomph::Problem::calculate_continuation_derivatives(), oomph::FoldHandler::FoldHandler(), oomph::Problem::get_inverse_mass_matrix_times_residuals(), oomph::HopfHandler::HopfHandler(), oomph::Problem::newton_solve(), oomph::Problem::newton_solve_continuation(), oomph::AugmentedBlockFoldLinearSolver::resolve(), oomph::BlockPitchForkLinearSolver::resolve(), oomph::AugmentedBlockPitchForkLinearSolver::resolve(), oomph::AugmentedBlockFoldLinearSolver::solve(), oomph::BlockPitchForkLinearSolver::solve(), oomph::AugmentedBlockPitchForkLinearSolver::solve(), oomph::BlockHopfLinearSolver::solve(), oomph::ARPACK::solve_eigenproblem(), and oomph::BlockHopfLinearSolver::solve_for_two_rhs(). Definition at line 233 of file linear_solver.h. Is documentation of solve times enabled? Definition at line 125 of file linear_solver.h. Referenced by oomph::ProjectionProblem< PROJECTABLE_ELEMENT >::project(). Boolean flag indicating if resolves are enabled. Definition at line 128 of file linear_solver.h. Referenced by oomph::Problem::calculate_continuation_derivatives(), oomph::FoldHandler::FoldHandler(), oomph::HopfHandler::HopfHandler(), and oomph::Problem::newton_solve_continuation(). Reimplemented in oomph::SuperLUSolver, oomph::DenseLU, and oomph::IterativeLinearSolver. Definition at line 187 of file linear_solver.h. Definition at line 198 of file linear_solver.h. Definition at line 110 of file linear_solver.h. Definition at line 227 of file linear_solver.h. Reimplemented in oomph::HelmholtzGMRESMG< MATRIX >, oomph::GMRES< MATRIX >, oomph::DampedJacobi< MATRIX >, oomph::BlockHopfLinearSolver, oomph::GS< CRDoubleMatrix >, oomph::AugmentedBlockPitchForkLinearSolver, oomph::HypreSolver, oomph::GS< MATRIX >, oomph::BlockPitchForkLinearSolver, oomph::SuperLUSolver, oomph::BiCGStab< MATRIX >, oomph::AugmentedBlockFoldLinearSolver, oomph::TrilinosAztecOOSolver, oomph::CG< MATRIX >, oomph::HSL_MA42, and oomph::MumpsSolver. Definition at line 172 of file linear_solver.h. Implemented in oomph::HelmholtzFGMRESMG< MATRIX >, oomph::HelmholtzGMRESMG< MATRIX >, oomph::GMRES< MATRIX >, oomph::DampedJacobi< MATRIX >, oomph::BlockHopfLinearSolver, oomph::ComplexGMRES< MATRIX >, oomph::GS< CRDoubleMatrix >, oomph::AugmentedBlockPitchForkLinearSolver, oomph::HypreSolver, oomph::GS< MATRIX >, oomph::BlockPitchForkLinearSolver, oomph::SuperLUSolver, oomph::MGSolver< DIM >, oomph::ComplexDampedJacobi< MATRIX >, oomph::BiCGStab< MATRIX >, oomph::TrilinosAztecOOSolver, oomph::AugmentedBlockFoldLinearSolver, oomph::FD_LU, oomph::CG< MATRIX >, oomph::DenseLU, oomph::HSL_MA42, and oomph::MumpsSolver. Referenced by oomph::ProblemBasedShiftInvertOperator::apply(), oomph::Problem::calculate_continuation_derivatives(), oomph::FoldHandler::FoldHandler(), oomph::Problem::get_inverse_mass_matrix_times_residuals(), oomph::HopfHandler::HopfHandler(), oomph::Problem::newton_solve(), oomph::Problem::newton_solve_continuation(), oomph::SolidICProblem::set_newmark_initial_condition_consistently(), oomph::HSL_MA42::solve(), oomph::DoubleMatrixBase::solve(), oomph::FD_LU::solve(), oomph::AugmentedBlockFoldLinearSolver::solve(), oomph::BiCGStab< MATRIX >::solve(), oomph::BlockPitchForkLinearSolver::solve(), oomph::AugmentedBlockPitchForkLinearSolver::solve(), oomph::GS< MATRIX >::solve(), oomph::GS< CRDoubleMatrix >::solve(), oomph::ComplexGMRES< MATRIX >::solve(), oomph::BlockHopfLinearSolver::solve(), oomph::GMRES< MATRIX >::solve(), oomph::HelmholtzGMRESMG< MATRIX >::solve(), oomph::ARPACK::solve_eigenproblem(), and oomph::BlockHopfLinearSolver::solve_for_two_rhs(). Reimplemented in oomph::HelmholtzGMRESMG< MATRIX >, oomph::GMRES< MATRIX >, oomph::DampedJacobi< MATRIX >, oomph::BlockHopfLinearSolver, oomph::GS< CRDoubleMatrix >, oomph::HypreSolver, oomph::AugmentedBlockPitchForkLinearSolver, oomph::GS< MATRIX >, oomph::BlockPitchForkLinearSolver, oomph::SuperLUSolver, oomph::BiCGStab< MATRIX >, oomph::TrilinosAztecOOSolver, oomph::AugmentedBlockFoldLinearSolver, oomph::FD_LU, oomph::CG< MATRIX >, oomph::DenseLU, oomph::HSL_MA42, and oomph::MumpsSolver. Definition at line 147 of file linear_solver.h. Reimplemented in oomph::HelmholtzGMRESMG< MATRIX >, oomph::GMRES< MATRIX >, oomph::BlockHopfLinearSolver, oomph::ComplexGMRES< MATRIX >, oomph::GS< CRDoubleMatrix >, oomph::AugmentedBlockPitchForkLinearSolver, oomph::GS< MATRIX >, oomph::BlockPitchForkLinearSolver, oomph::BiCGStab< MATRIX >, oomph::AugmentedBlockFoldLinearSolver, oomph::FD_LU, oomph::DenseLU, and oomph::HSL_MA42. Definition at line 159 of file linear_solver.h. Definition at line 88 of file linear_solver.h. Referenced by disable_computation_of_gradient(), oomph::SuperLUSolver::enable_computation_of_gradient(), and oomph::SuperLUSolver::solve(). Boolean flag that indicates whether the time taken. Definition at line 84 of file linear_solver.h. Referenced by oomph::MumpsSolver::backsub(), oomph::DenseLU::DenseLU(), disable_doc_time(), oomph::MGSolver< DIM >::disable_output(), oomph::MGSolver< DIM >::disable_v_cycle_output(), enable_doc_time(), oomph::MGSolver< DIM >::enable_output(), oomph::MGSolver< DIM >::enable_v_cycle_output(), oomph::MumpsSolver::factorise(), oomph::HypreSolver::HypreSolver(), is_doc_time_enabled(), oomph::MumpsSolver::resolve(), oomph::TrilinosAztecOOSolver::resolve(), oomph::SuperLUSolver::resolve(), oomph::HypreSolver::resolve(), oomph::MumpsSolver::solve(), oomph::DenseLU::solve(), oomph::FD_LU::solve(), oomph::TrilinosAztecOOSolver::solve(), oomph::SuperLUSolver::solve(), oomph::HypreSolver::solve(), oomph::GS< CRDoubleMatrix >::solve(), oomph::HelmholtzGMRESMG< MATRIX >::solve(), oomph::HelmholtzFGMRESMG< MATRIX >::solve(), oomph::GS< CRDoubleMatrix >::solve_helper(), oomph::TrilinosAztecOOSolver::solve_using_AztecOO(), and oomph::TrilinosAztecOOSolver::solver_setup(). Boolean that indicates whether the matrix (or its factors, in the case of direct solver) should be stored so that the resolve function can be used. Definition at line 80 of file linear_solver.h. Referenced by disable_resolve(), oomph::TrilinosAztecOOSolver::disable_resolve(), oomph::HypreSolver::disable_resolve(), enable_resolve(), is_resolve_enabled(), oomph::MumpsSolver::solve(), oomph::HSL_MA42::solve(), oomph::DenseLU::solve(), oomph::CG< MATRIX >::solve(), oomph::AugmentedBlockFoldLinearSolver::solve(), oomph::TrilinosAztecOOSolver::solve(), oomph::BiCGStab< MATRIX >::solve(), oomph::SuperLUSolver::solve(), oomph::BlockPitchForkLinearSolver::solve(), oomph::GS< MATRIX >::solve(), oomph::HypreSolver::solve(), oomph::AugmentedBlockPitchForkLinearSolver::solve(), oomph::GS< CRDoubleMatrix >::solve(), oomph::BlockHopfLinearSolver::solve(), oomph::DampedJacobi< MATRIX >::solve(), oomph::GMRES< MATRIX >::solve(), oomph::HelmholtzGMRESMG< MATRIX >::solve(), oomph::HelmholtzFGMRESMG< MATRIX >::solve(), oomph::HSL_MA42::solve_for_one_dof(), and oomph::BlockHopfLinearSolver::solve_for_two_rhs(). DoubleVector storing the gradient for the globally convergent Newton method. 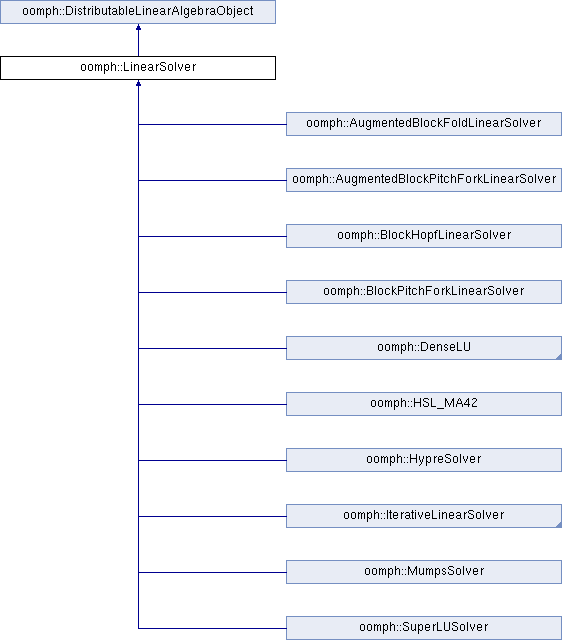 Definition at line 95 of file linear_solver.h. Referenced by get_gradient(), reset_gradient(), and oomph::SuperLUSolver::solve(). Definition at line 91 of file linear_solver.h. Referenced by get_gradient(), and oomph::SuperLUSolver::solve().